A website is paramount to creating your online presence, with the largest traffic originating from organic sources. When the initial focus is to build an attractive site, most businesses don’t realize the importance of SEO until it’s too late. Your website may look nice, but if you neglect adding the marketing elements at the time of conception you could be losing out on a great deal of potential traffic. Our team of talented web designers are able to build an SEO-friendly site that allows search engines to read, understand and explore your site easily. Your visibility in the search engine results pages is enhanced if a search engine can quickly navigate and understand your site’s content. From WordPress, Squarespace or Weebly CMS, we build websites with an SEO foundation for optimal performance. Our experienced web designers pay attention to detail and ensure that all relevant elements of SEO are properly incorporated, before a website is launched. Careful planning and a well-structured approach are necessary to build a site that is able to produce relevant traffic. Creating sites with a modern coding standard maximizes your position on search engines and quickly converts your visitors into tangible ROI. Focusing on your target market, we are able to create custom website design, that is optimal for maximizing your online presence and increasing your conversions. Web design is the exciting moment when everything you’ve been imagining begins to take shape. It is no wonder that setting up a website is usually one of the first things people do when they start a company. Choosing themes, fonts and images are all a part of making the company feel "more real". However, there’s something that many people don't realize about web design: your page can be extremely well-put together, but if you don't have the proper SEO behind it, then it is likely that you and your developer will be the only ones who see it. There are many talented web designers out there. They are able to create themes to your exact specifications and make sure that your vision becomes a reality. However, this does not guarantee that they will design with SEO in mind. This lack of foresight may not affect your aesthetics, but it will ensure that no one is able to navigate once on your site. Whenever someone visits your website, the first thing they will look for is a map, your navigation, which will help guide them through your pages. If your navigation is clear, then their visit will feel easy and effortless. However, if the navigation is not straightforward and they're unsure about what you're offering or how to find more information about you, they'll quickly leave the website. Traffic that does not spend a certain amount of time on your page, negatively effects your search engine ranking. Our web designers are aware of this. We don't want to leave any room for confusion or doubt. Every design choice is made with your visitors' perspective in mind. Our goal is to make their experience intuitive and seamless. If you have ever tried navigating a website with multiple themes, you have likely felt the frustration of a poorly designed experience. There is nothing wrong with originality, but when creativity gets in the way of consistency it can create a negative exposure for your visitors. It is paramount to both share your message while creating a streamlined navigation approach. Combining creativity with a user friendly site is the best way to optimize your traffic. Creating accurate titles helps your clients quickly make their way through your site. This guarantees user experience and bolsters your traffic. Your titles need to be clear and concise in order to keep customers on your website. Our designers are dedicated to your customers experience and enabling them to move through your pages. We’ve made it our goal to anticipate your visitors’ expectations. We excel at providing accurate text and images that are able to order and describe the linked pages. This way there is no guesswork and your visitors are able to comfortably and seamlessly move through your website. When a visitor approaches your site, they often are looking for specific material. They don’t want to get lost sifting through extra information. Creating an easy to use search feature is necessary to strengthen user navigation. Knowing that you have a user-friendly website that visitors can quickly find the answers they need, will keep traffic filtering back to your site. We make sure that this feature is always in working order and that it produces relevant results. Our designers are able to compensate for misspellings and will make sure that it shows similar products you offer. User experience means everything when it comes to web design and it demands that visitors are able to easily maneuver through your site. Does this mean that you should put the visual aspect of your web design on the back burner, that it won’t really matter? Of course not. You need to leave room for an excellent visual impression. However, when it comes to web design, make sure that you prioritize SEO from the very beginning; see our on-page SEO services and content marketing services. Inbound marketing deals with several aspects, SEO is more than keywords, it’s also their placement; view our link building services. 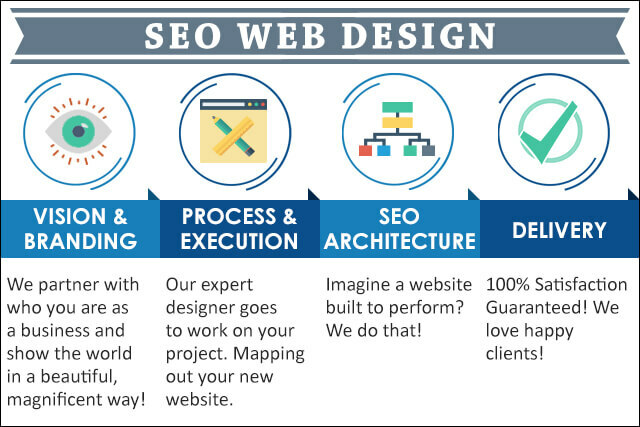 Hiring a professional who understands the necessity of quality SEO and how it can bolster your business is the most important stage of website development. Our designers know that the best design makes it easy for users as well as search engines to navigate your web page. We value experience and drive results.